Photojojo has introduced a new lens for Micro Four Thirds cameras from Olympus and Panasonic. The new lens is focused manually, and features soft bokeh, vignetting, lens flares and low contrast for a 'lo-fi' feel. It also offers a very shallow depth of field for tilt-shift-like photo effects. The aperture can be set from f/1.4 to f/16 to give different effects from blurred backgrounds to shallow selective focus, which Photojojo claims is similar to the effects that can be achieved with a Lensbaby. 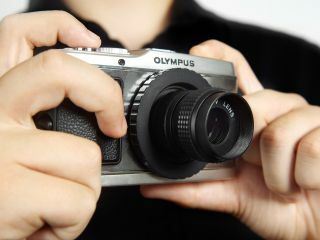 The lens can be attached to Micro Four Thirds cameras, such as the Olympus PEN or Panasonic G series using the C-mount adapter that comes in the box. Capable of focusing down to 0.3 metres, the lens has a 25mm focal length, which is equivalent to 50mm in the 35mm format. The Lo-fi Micro Four Thirds lens is available for $90 (£57), making it much cheaper than any current Micro Four Thirds lens on the market. Photojojo is an American photographic company that specialises in quirky accessories including lenses, bags and cameras. The company recently announced an iPhone SLR lens mount.